HOW TO FIND PRODUCT YOU ARE LOOKING FOR. As the first option we recommend to use Search engine attached to this website. Type a Keyword to the Search field and browser will find items which match and are currently available in our webstore. If the product You are looking for is not in proposed list, You can take a look in Catalogues exposed. Catalogues consist more than 40 000 items and hopefully amongst them You can find product You just need. All prices are in Euros and include VAT 20 % (Tax rate for books and publications is 9 %). EU residents subject to VAT can purchase products tax-free. Such customers have to send their company`s ascribed VAT code, when forwarding order. Delivery time for products which are available in webstore You can find by clicking on detailed view of particular item. - If You prefer delivery mark corresponding box and appoint delivery address. - click Confirm Order, Your order will be sent and registrated. After registration, Order Confirmation will be sent to Your e-mail as a feedback. At the latest during next working day You will be contacted by phone or e-mail and informed about expected delivery time and details. After that Proforma Invoice will be sent to Your e-mail. Pyrotechnical items: The shipment of dangerous goods, such as pyrotechnical items, are only sold to people over 18 years old and only shipped directly to the purchaser of the goods with a Estonian delivery address. Payment according to invoice to be done by bank transfer. When forwarding Bank Transfer please specify in settlement field also invoice number and consignee. Also You can pay securely with Your credit card through Paypal account. For articles, delivery time exceeding 14 days partial prepayment is required. In this case at least 50 % to be prepaid, another 50 % to be paid just before dispatching from our stock to appointed delivery address. HANDING OVER / DELIVERY PRODUCTS. If You prefer delivery to appointed address by Courier, additional transport fees will be added to purchase price. Transport fee depends on weight, dimensions and distinctive character of product. Prices for delivery and additional transport services are available HERE. Transport tax is included and shown separately on the Invoice. Ordered products will be dispatched from stock the latest during next working day after Your Bank Transfer come in to our account. 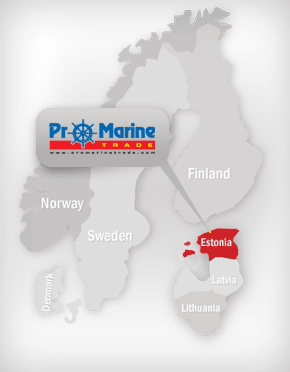 Ordered products will be delivered to Estonian residents by Courier to appointed address during 08.00 – 20.00 next working day. Courier will contact You by phone and notify in advance, If he cannot reach You by phone and also in appointed address, You can pick up delivered product in the nearest Post Office.